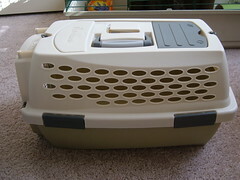 I have needed a carrier for Cocoa so I can take him to the vet. After looking around and comparing prices, I decided to order one online from Petsmart. I ordered it last Monday and got it two days later! Everything was packaged nicely and the service was so quick. I would definitely order from them again. 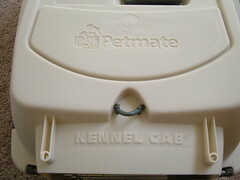 Without further ado, here's the new carrier! I let Cocoa check it out and he is happy with it! He fits in it very nicely too! 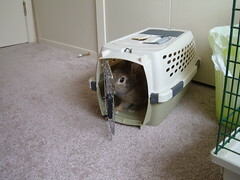 Cocoa probably thinks this carrier is his new toy! He loves going in it, and then running out. How cute! I guess the next step is to make his vet appointment. Oh boy! it almost looks like he's trying to pull the door closed in the last picture ... excuse me Mom but i need my privacy! Hehe, man you always get the best pics! Cocoa looks so cute. I hope that he still loves his carrier after the vet trip! My kids hate the site of the carrier! 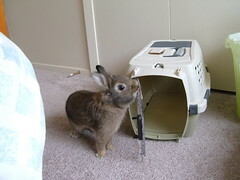 I found you on Hugo, Mabelline and Bungee's page - i've added you to my warren - nice to have you along! yeah i love popcorn and so does the other house bunny here, Archi Ann. But i hear the 2 buns that live outside don't like it at all. ah well, they don't know what they're missing! but of course my human doesn't let me have much - she's such a kill joy!